Hide deals from seller "Ti Amo Cafe Italiano"
Limit 1 per person and 1 per table. Valid on 2 Penne Arrabbiata dinner entrees. Promotional value expires 30 days after purchase. 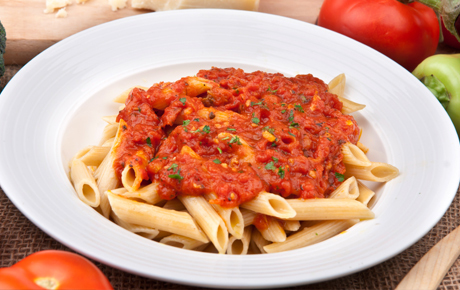 Summer just got even hotter with 50% off two Penne Arrabbiata entrees from Ti Amo Cafe Italiano in Hoffman Estates ($16 value). Delight your senses with a delicious dinner-sized portion of penne pasta, topped with spicy marinara sauce made from the highest-quality ingredients, and served with soup or salad. Chef Gar Aparicio invites you to fall in love with Ti Amo Café Italiano’s food, service and inviting atmosphere. Under new ownership, the staff welcomes you to try their impressive menu, which includes antipasto, salads, sandwiches, steak and much more. All palates are sure to be pleased, as they also offer plenty of options for vegetarians, including gnocchi de spinaci or melanzane parmigiana. Top off the night with a glass of wine while you enjoy live entertainment. Enjoy a delicious meal with this delightful deal. An Italian restaurant in Hoffman Estates that has been in business for 32 years.